When asked about what women are writing about in Indonesia, novelist Eliza Vitri Handayani reminded the audience that there are no limits on what women can write, and the challenge isn’t finding a subject to write about, but claiming space, fighting for equal opportunities, and getting wider audiences and appreciation not only from women readers. The fiction pieces run the gamut from straight-up mimesis, through allegory, and into the fully fantastical. Favorites from the more true-to-life end of the spectrum include Eliza Vitri Handayani’s “Higher” (Trash), which feels like an Indonesian Human Traffic in the way it juxtaposes hedonistic youth counterculture with the need to maintain a respectable façade for the out-group norms of the nine-to-five. I decided to include writers with a strong, original approach to realist subjects—writers who are perhaps incredible storytellers or break new ground in terms of subject matter, like Eliza Vitri Handayani, Balli Kaur Jaswal, and Jing-Jing Lee. On the other side of the city, at the Footscray Community Arts Centre, Eliza Vitri Handayani, Shakira Hussein and Monique Toohey were on the Muslim Feminism panel. Perhaps because of its location, the people on the panel and the topics discussed, the audience that came was visibly more diverse than what one usually finds in Federation Square – younger and less white, more Muslim. The Melbourne Writers Festival took a risk this year in its attempts to diversify audiences, and ought to continue in future. The epistolary nature of the novel is effective in part because it shows the illusion of intimacy fed by long distance communication. There are many fresh ideas in the novel, such as the boxes in which the lead characters keep precious photos and letters, especially those from their shared history. The story of Rizky and Julita is the story of Indonesia in conflict with itself: the traditional, rule-respecting side and the independent side, yearning for political, artistic and personal freedoms. Theirs is a universal coming of age story, and a love story. Writers and literary translators Eliza Vitri Handayani and Tiffany Tsao discussed their latest books, the challenges of translating between Indonesian and English, and the future of Southeast Asian literature. Eliza talks to AIYA about setbacks to freedom of expression in Indonesia, advice for writers wishing to confront sensitive topics, and promoting minority writers beyond their niches or boxes. The intersection of feminism and Islamic identity. How compatible are the two? With Shakira Hussein, Eliza Vitri Handayani, and Monique Toohey. Moderated by Luthfiye Ali. Why do we write? was the salient question put to the international writers at Writers Across Borders hosted by WrICE co-founder David Carlin on Friday night. For Eliza Vitri Handayani, who frequently writes about young people on the brink of change, writing is about facing your demons, dealing with trauma and telling painful stories from the past. August 2016 Eliza was offered an opportunity to work with a book club and writing club made up of school-aged children at a center for writing called 100 Story Building, aimed at building opportunities for the most marginalized young people in the community. The children responded to an extract from Stephen Chbosky’s The Perks of Being a Wallflower. Writers, including Eliza, responded to the prompt, the children responded then to her response, and then other writers responded to the children’s response, and so on. Eliza Vitri Handayani (WrICE 2016) grew up under the Suharto regime in Indonesia, when there was no freedom. On 21 May 1998, after tens of thousands of university students demanded his resignation, Suharto finally announced his resignation. “It meant more than a change of government; it meant that it’s okay to be yourself and that you can speak the truth,” Eliza said. This led Eliza to question what it means to be free, to break away from all things that constrain us. She explored this theme in her book From Now On Everything Will Be Different. What makes a novel distinctly Indonesian? And have Indonesian writers had less freedom in the past year? Eliza Vitri Handayani and Maggie Tiojakin discuss Indonesian literature after the political upheaval of 1998 and the different types of censorship and regulation that determine what is written about. Acclaimed writers from Australia, China, Indonesia and the Philippines will share their work and experiences, inspired by their immersion in new cultures through the Writers Immersion and Cultural Exchange Program (WrICE). This event will feature Fan Dai, Eliza Vitri Handayani, Michele Lee, Alice Pung, Maggie Tiojakin, Xu Xi and Larry Lacambra Ypil, plus emerging writers Mia Wotherspoon, Peter Clynes and Ara Sarafian. At Muslim Feminism Panel Eliza Vitri Handayani and Shakira Hussein dissected the intersection of feminism and Muslim identity. The Official Launch of WrICE 2016 took place at RMIT Design Hub. International guest writers Alice Pung, Michele Lee, DAI Fan (China), Eliza Vitri Handayani and Maggie Tiojakin (Indonesia), Larry Ypil (Philippines) and more performed an intercultural collage of readings, which inspired much laughter and reflection. At Protest and Rebellion, held at ACMI, Eliza Vitri Handayani and artist Molly Crabapple discussed the power of art as a protest tool. The Indonesian writer described herself as shy and awkward in person but on the page she is fierce, refusing to shy away from controversial topics… She was undaunted by the reactions of authorities — or on social media — to her views, saying it was important to be smart in your protests. This week we’re excited about the launch of the Melbourne Writers Festival program, as we announce the details of our co-curated FWF public events, which will be held on Saturday 27 and Sunday 28 August. Melbourne Writers Festival 2016: Eliza Vitri Handayani to appear at the festival. She will appear in these sessions: Muslim Feminism (27 Aug), Protest & Rebellion (2 Sep), and Writers Across Borders (2 Sep). Maesy Ang dari toko buku Post berbicara dengan Eliza Vitri Handayani dan Syarafina Vidhyadana tentang buku-buku feminis. Eliza Vitri Handayani’s new short story “Someplace between Respect and Desire” will be read at this famous literary bar in New York City, along with the works of eight other writers from their literary magazine’s June issue. From Now On Everything Will Be Different is not a love story, nor is it a book about Indonesia. Although Eliza Vitri Handayani’s first novel in English depicts an on-again, off-again relationship set against the fallout of Soeharto’s New Order, both elements seem tangential to a larger, more ambitious project. Call it the paradox of time, where the title is constantly at war with Handayani’s portraits of society and characters, which seem, in different ways, unable to move on; where all the action happens within a day, crosscut with flashbacks to various moments in the past. Call it the difficulty of art, where photographer Juli’s attempts to capture her world are always on the cusp of something monumental, but somehow fall short, are aborted. Call it the absurdity of life, where doctor Rizky and Juli enact a years-long game of waiting for Godot, trying again and again to meet, to be honest with each other, even as nothing really happens between them. Far more politically dangerous is a novel that deals with ambiguity, complexity, and paradox than one which is baldly political, ideological, an activist in paper form. Rizky and Juli, even as they are well-rounded and compelling figures in their own right, also dramatise the artist’s struggle to capture a moment, a soul, the smell of the air, the human condition in all its dignity and ridiculousness. Seruan ini adalah sebagai respon atas pemberangusan buku yang sedang marak terjadi. Ini adalah sebuah ironi, karena di satu sisi orang mengupayakan budaya baca, namun di sisi lain aktivitas literasi dikebiri. Sikap MIWF tegas, menentang upaya pemberangusan tersebut dengan mengeluarkan Seruan Makassar. MIWF menampilkan penulis-penulis dari mancanegara seperti Australia, Jepang, Prancis, Jerman, dan beberapa dari kawasan Asia Tenggara; juga penulis-penulis Indonesia ternama seperti Joko Pinurbo, Aan Mansyur, Dewi Lestari, Eka Kurniawan, Eliza Vitri Handayani, termasuk penulis muda asal Makassar yang tengah naik daun, Faisal Oddang. Territory writers will learn from two renowned Indonesian authors at this year’s NT Writers’ Festival thanks to a $5000 Northern Territory Government Grant…. With Indonesia being our closest neighbour, it is fantastic that we are strengthening cultural ties and friendships with Indonesia through the arts scene. … Eka Kurniawan’s book Beauty Is A Wound is an amazing novel that takes in Indonesia’s varied history while also telling a family saga. Eliza Vitri Handayani is an emerging author whose novel From Now On Everything Will Be Different conveys the pressures faced by young people growing up in Indonesia today. From Now On Everything Will Be Different traces the relationship between two young spirits yearning to be free. … I couldn’t help feeling the tension and had to resist flipping to the end to see what happens. … The novel enters deeply inside the hearts and minds of its protagonists, and it explores moral issues more fearlessly than her compatriot writers usually do. Buku ini adalah potret paling dekat dari kontemplasi-kontemplasi liar yang ada di kepala kita atau tertuang dalam percakapan warung kopi yang kemudian dikaji dan ditulis dengan apik oleh penulis. … Buku ini tidak hanya membuat hati saya berdesir, tapi juga membuat kepala saya tidak berhenti berkontemplasi. Kita diajak mengkaji lagi perspektif kita soal kehidupan kita sehari-hari, isu-isu yang begitu dekat dengan kita. WrICE is a program of reciprocal cultural exchange and cultural immersion focused on writers and writing initiated by the non/fictionLab at RMIT and generously supported by the Copyright Agency Cultural Fund. … The writers awarded WrICE fellowships in 2016 are Mary Rokonadravu (Fiji), Lawrence Lacambra Ypil (The Philippines), Dai Fan (China), Eliza Vitri Handayani (Indonesia) and Maggie Tiojakin (Indonesia). I sincerely believe that girls and women should be free and safe to be true to themselves, and to explore their interests, rather than having to follow some arbitrary rules. LadyFast is organized by Kolektif Betina, a gathering of women from various backgrounds who want to provide safe space for women to speak up, “as a first step to overcome discrimination,” its manifesto says. That night, at around 10 p.m., a crowd attacked the festival. The crowd pushed themselves into Survive!’s private space and caused destruction to the property. The police stood by watching. Saat menulis, saya katakan pada diri sendiri bahwa saya harus jujur, pintar, dan tidak takut. Eliza Vitri Handayani’s novel From Now On Everything Will Be Different is a study of relationship, freedom, and identity in post-Reformasi Indonesia. It shows the complex reality of a nation in transformation, and how it affects its characters’ internal landscape. “…my characters were among those people who are often misunderstood and labelled as immoral. That is why I want them to convey their views directly, not through narrative but through letters. I also think that this represents the story of our generation. … My generation grew up restricted and repressed, which is why we should make the best of the Reformasi, this opportunity to break free, live our lives, love as we choose and work as we choose,” she said at the launch, where she wore a dress made of scrap papers from her book draft. It’s a really interesting book which brings to life what it’s really like to live in a country in transition from a military dictatorship to democracy. The characters are convincing, and their dilemmas engaging. I’d really like this book to be widely read by Australians: we tend to have a monochrome vision of Indonesia, and this story brings vivid colour instead. Indonesian and Indonesia-related books, as always, made up a large portion of my reading list. 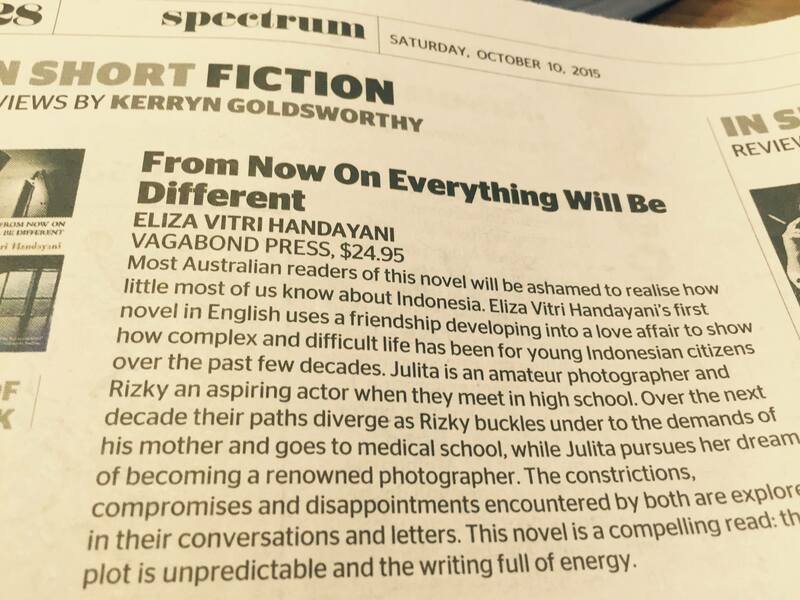 … I rounded off the year with From Now On Everything Will Different by Eliza Vitri Handayani. And I think its starry-yet-sober-eyed vigor will stay with me well into 2016. ~Tiffany Tsao, Asymptote’s editor-at-large for Indonesia. Within the stifling humidity that built ahead of Bali’s overdue wet season, the 12th annual Ubud Writers and Readers Festival was swollen with pregnant conversation. … Several thousand visitors gathered in the last days of October for the literary festival – much more a robust contemplation and discussion forum than a commercial book fair – and all were talking candidly about freedom of speech, because the ogre of censorship had reared its ugly head. Reactions from festival goers and other artists were encouraging with Handayani giving out business cards explaining her T-shirt protest. She sold out of copies of her book that she’d carried around the festival in her backpack, and a friend in Vietnam reached out to say her protest has started conversations over there about unique ways to circumvent censorship. Frankfurter Allegemeine Zeitung (04/11/2015): Nur nicht über die Massaker reden! Auch die Präsentation des gerade auf Englisch erschienenen Romans „From Now On Everything Will Be Different“ von Eliza Vitri Handayani, die darin eine Liebesgeschichte am Ende der Diktatur Suhartos und in den Jahren der Reformära nach seinem Sturz 1998 erzählt, und die Podiumsdiskussion zu einem auf Bali wegen der befürchteten Auswirkungen auf die Umwelt umstrittenen Bauprojekt wurden von der Festivalleitung auf Druck der Behörden fallengelassen. Letztere Veranstaltung fand dann allerdings an einem anderen Ort auf Bali statt. Alle Repressionen erfolgten auf unklarer Rechtsgrundlage, obwohl sich die größte Demokratie Südostasiens gern – und meist auch zu Recht – ihrer großen und lebendigen Presse- und Medienvielfalt rühmt. Eliza Vitri Handayani hatte nach der Streichung ihrer Buchpräsentation übrigens die schöne Idee, dennoch zum Festival zu fahren und sich jeden Tag in einem T-Shirt mit eigens aufgedrucktem neuen Auszug aus dem Roman fotografieren zu lassen. Die von ihr selbst mitgebrachten Exemplare des Werks sollen schnell ausverkauft gewesen sein. Kisah cinta antara Rizky dan Julita terasa sangat personal, terutama saat keduanya yang punya banyak kekasih saling berbagi rahasia terdalam dalam hidup mereka. Dikemas dengan latar belakang Indonesia yang bergerak menuju gerbang demokrasi, karakter keduanya dibangun secara pararel dengan tahapan reformasi negeri ini, saat para seniman bebas dari sensor dan lebih leluasa menyuarakan aspirasinya. Inilah kisah tentang perjalanan dua anak manusia mencari kebebasan, menjalani hidup dengan jujur dan menemukan belahan jiwa yang bersedia mencintai diri kita apa adanya. The Indonesian author Eliza Vitri Handayani, who spoke from the floor about the pressures to self-censor and changes publishers made to her first book, wore a series of T-shirts featuring the text of her latest title, From Now On Everything Will Be Different, which was due to be launched at one of the cancelled sessions. The canceled sessions included discussions and book launchings on novels related to the 1960s upheaval, but Eliza says her novel is about today’s reformasi generation. “We want to explore what it means to be free,” she said. “In accordance with the request of the local government and police that the organizers cancel events that could potentially cause controversy and do not comply with the permit of the festival as a cultural, arts and tourism promotion event, organizers decided to cancel the book launch,” Juniartha said. Ubud Writers and Readers Festival national program manager I Wayan Juniarta said local authorities had advised the festival to drop any events related to 1965 or that contained sensitive issues. He said a decision was made to hold off on the launch because although it was a work of fiction it contained references to real places in Indonesia and sensitive issues. There was the fact that the censorship was oddly haphazard. One of the books whose launches were cancelled — Eliza Vitri Handayani’s From Now On Everything Will Be Different (book title irony not intended) — isn’t really about 1965 at all. There was the fact that the censorship made no real practical difference. Books dealing with the 1965 killings have been appearing for a while without any attempt to ban them. Over the last month, Eliza Vitri Handayani has been busy, launching her new novel From Now On Everything Will Be Different at Beijing Bookworm, alongside Hong Ying’s I Too Am Salammbo (translated by Mabel Lee), then onto launches and readings in Oslo, the Frankfurt Book Fair, Manila at the Asia-Pacific Writers and Translators conference where she was joined by future fellow vagabond Beth Yahp, and then to the Ubud Writers and Readers Festival where her launch was one of the events caught up in the series of cancellations requested by local authorities. Being Silenced in Ubud (opinion, 11/11/2015) by Andina Dwifatma. Indonesian translation on her blog: Catatan yang Tercecer. Eliza Vitri Handayani has written a book about [young people] in the early reform period in 1998, entitled From Now On Everything Will Be Different. She talked about neither communism nor 1965 in the book. During the event Eliza walked around wearing a T-shirt depicting scenes from her novel, and handed out her name cards explaining the cancellation of her book launch. After warnings from local police, the Ubud Writers & Readers Festival 2015 has had to cancel the launch of Eliza Vitri Handayani’s novel From Now On Everything Will Be Different. The festival organizers have kindly kept open an invitation for Eliza to attend the festival, which she has accepted. Each day she will wear a t-shirt with different extracts from her novel as a form of peaceful protest. For Eliza Vitri Handayani, an Indonesia writer and founder of an Indonesian literary translation initiative, APWT is indeed profoundly important. After reading her fiction at an earlier APWT forum in Bangkok she was approached by Australian poet based in Tokyo Michael Brennan about publishing her work in his new publishing venture, Vagabond Press, focused on Asian writing. Brennan, who is also an academic, has since published other APWT members he heard at the conferences, including Japanese writer Kyoko Yoshida. Handayani’s newly published novel, From Now On Everything Will Be Different, was launched during the conference. LAF continues its partnership with Weltempfang, Centre for Politics, Literature and Translation, one of the Frakfurt Book Fair’s prime hubs for exchange of ideas. How does writing from other continents find its way to publishers in today’s competitive book industry and how do we interact with markets and literary scenes as remote as those of China, India or Indonesia? LAF talks to Eliza Vitri Handayani (Indonesia), InterSastra; David Lopez-del Amo (Spain/China), Sinicus; and Vinutha Mallya (India), Kaavi. Most Australian readers of this novel will be ashamed to realise how little most of us know about Indonesia. … This novel is a compelling read: the plot is unpredictable and the writing full of energy. Ubud Writers & Readers Festival (17/09/2015): From Now On Everything Will Be Different will be launched on Saturday, 31 October, 4:30-6:00 p.m. at the Elephant restaurant, introduced by Sofie Laguna, winner of the Miles Franklin Literary Award 2015. ‘New Asia Now’, a selection of essays, fiction, poetry, memoir and reportage by some of Asia’s most exciting writers today, will be published in August 2015 by the Australian literary magazine Griffith Review, with a selection of the work also published in the Asia Literary Review. The authors who appear in these editions are, the editors believe, voices that matter. From the Griffith Review: The Asian century is in full swing, generating unprecedented economic and social power. In coming decades this will profoundly change the world, and the lives of all those living in the world’s most populous region. Griffith Review 49: New Asia Now showcases outstanding young writers from the countries at the centre of Asia’s ongoing transformation. They write about the people and places they know with passion, flair, and insight. All born after 1970, our contributors are cultural agenda setters at home who explore issues of identity and belonging in the new world that is unfolding. Griffith Review 49: New Asia Now, co-edited by Julianne Schultz and Jane Camens, takes a journey through the region’s diversity, featuring a new generation of literary stars who will shape the way we understand the complexities of culture, politics and modernisation.